Sage's Coal is an Upgrade Material in Dark Souls 3. 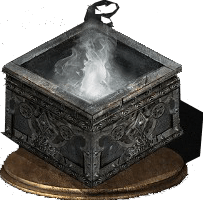 The white magic flame produced by this coal was given to the Undead Legion long ago by one of the Crystal Sage twins. Give to the blacksmith in the shrine to allow the use of gems for crystal, blessed, and deep infusion. Give to Andre to allow the use of Crystal Gem, Blessed Gem, and Deep Gem infusions. Farron Keep, from the first bonfire keep to the left side until you reach a small structure guarded by a darkwraith. The coal is in a body inside this structure. I just picked this coal up, then my Xbox one S crashed and I had to turn it back on and start up my Dark Souls III all over again. Is that a bad sign? Is that supposed to happen? Am I trippin? Does anyone here know?